Ciena’s Blue Planet team have won numerous accolades during this past year’s networking industry’s award season. I’m pleased to share the news about another recent award, won alongside our partner DGIT Systems, that recognizes the business impact our combined work is having on service providers’ business and operational agility. 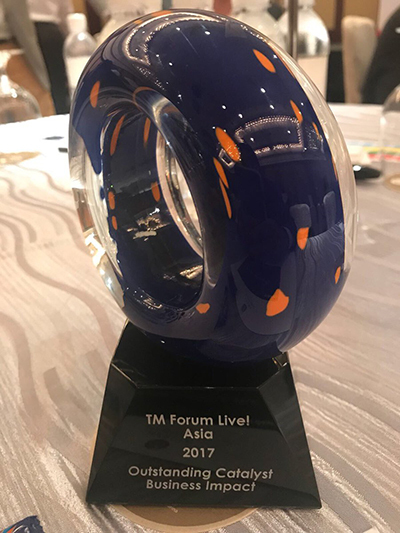 We earned our latest recognition from the TM Forum at the organization’s TM Forum Live! Asia event held in Singapore this past December. There, the Ciena Blue Planet team and DGIT were awarded Outstanding Catalyst for Business Impact for a collaborative proof-of-concept titled “Partnering Platforms for MEF Services.” The Catalyst demonstration, which was championed by Telstra, Vodafone Group and Orange, showcased the use of open APIs to automate the activation of inter-carrier Ethernet services. Why do I consider this award and demonstration so important? Well, in a nutshell, it’s because this successful collaboration showcases the viability of using open standard APIs to address one of the most significant challenges to business agility: rapid order-to-activation (which also means accelerating order-to-cash). Order-to-activation lag is especially problematic for inter-carrier services. Today, turning up services between different Communications Service Providers (CSPs) is an inordinately slow and complex process, often taking many months to complete. This particular Catalyst project demonstrated how CSPs can leverage a combination of open APIs from the TM Forum and MEF payload, along with service abstraction technology, to automate service delivery from end-to-end in minutes, and in doing so, streamline their ability to do business with one another. This particular Catalyst project demonstrated how CSPs can leverage a combination of open APIs from the TM Forum and MEF payload, along with service abstraction technology, to automate service delivery from end-to-end in minutes, and in doing so, streamline their ability to do business with one another. How to rapidly construct a new product offering based on a new network service and be able to sell that offering on the marketplace within minutes. Seamless coordination of off-net service orders between different CSPs. The use of open APIs as standardized touchpoints between the Customer Relationship Management layer (BSS) and Operations Support Systems (OSS), which could be reused for any type of network service. Telstra, one of the service provider champions actively supporting this Catalyst, used their network-as-a-service (NaaS) model to demonstrate the impact of the Partnering Platforms for MEF Services Catalyst project. As captured in the TM Forum Live demonstration video, Guy Lupo, Head of Network as a Service 2020 at Telstra, explained how this NaaS concept would be used by the company to separate network and operational domains from IT services: “We created a concept of domains, as a shell that can go above technologies in the network, to abstract and separate them from traditional IT systems”. The ‘Outstanding Catalyst for Business Impact’ award underscores how Ciena Blue Planet, with its partners, is helping drive powerful business outcomes by automating interfaces across various operations systems and service providers. This is one example of an Adaptive Network in action. As a team, we have proved that it’s possible for service providers and their digital ecosystem partners to automate order-to-activation processes, ultimately speeding time-to-revenue by accepting service orders through a customer portal and automatically activating services across multiple providers’ networks. And the work is not finished, as this Catalyst and its findings will continue to influence industry change. 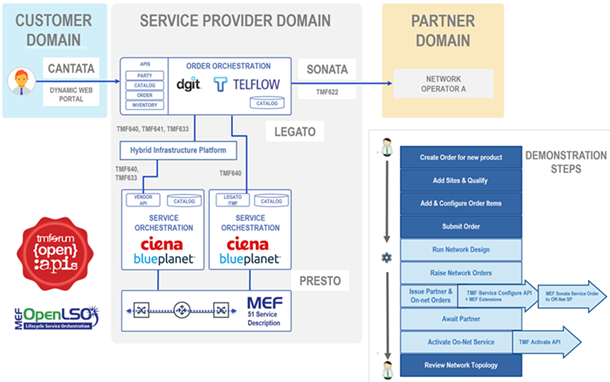 In the coming weeks and months, Ciena’s Blue Planet team will build on this open API work and look to incorporate Open Network Automation Platform (ONAP) interoperability for an enhanced Partnering Platforms for MEF Services Catalyst demonstration at the TM Forum Live Digital Transformation World event in Nice, May 2018. In addition, Ciena is working to demonstrate enterprise services that utilize Blue Planet, alongside technologies such as 5G, to demonstrate how network slicing can help address enterprise IoT-based services. We’re looking forward to seeing you at the upcoming event to showcase these new innovations! Check out the video introducing the Partnering Platforms for MEF Services Catalyst. This video was recorded at TM Forum Live! Asia in Singapore, with Guy Lupo, Head of NaaS 2020 – Network 2020 Transformation at Telstra Corporation and Greg Tilton, Founder and CEO of DGIT Systems.